Mattel announced the new geek-friendly figurine last week. The Society of Women Engineers and the National Academy of Engineering have put their stamps of approval on this techy doll. Barbie’s up to date with a binary code t-shirt, a stylish pink watch, and some geek-chic glasses. 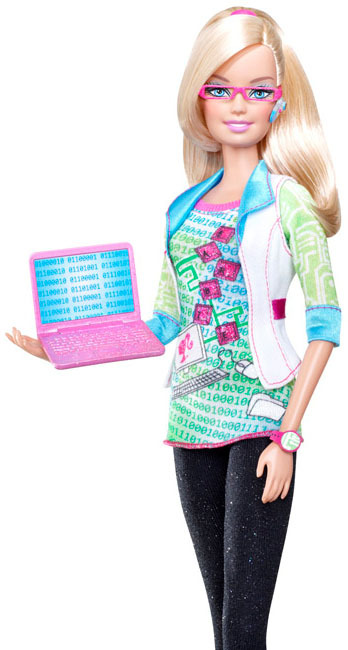 Computer Engineer Barbie also sports a Bluetooth earpiece and smartphone. I’m really happy Mattel decided to make this doll. Now little girls can aspire to be Computer Engineers and not just models. Watch Out, Computer Engineers: Barbie Wants Your Job – PCWorld.